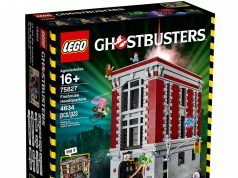 A short while ago, LEGO revealed the official images of the LEGO Ghostbusters Firehouse Headquarters (75827) that will be coming in January 2016. We can now also see inside of the Firehouse which shows tons of little details from Ghostbusters and Ghostbusters II including the lab where Egon is examining Louis, the dancing toaster, and the photography room where Egon is examining Vigo’s pictures, just to name a few. Check out the description of the set as well as more images below.